The affordability of water and wastewater rates is an issue attracting more attention than ever. In particular, “A Burgeoning Crisis? A Nationwide Assessment of the Geography of Water Affordability in United States”—a recent paper from Michigan State University— has generated a great deal of debate and dialogue about the issue. The paper is worth reading for yourself, but the primary conclusion is that over the next five years, at least 35.6% of the U.S. population will have combined water and wastewater bills greater than 4.5% of their community’s median household income. One aspect of the paper that stood out to us here at the EFC was the numerator in that calculation—i.e. the combined bill. The authors used data from a national rate survey carried out by AWWA and Raftelis Financial to calculate an average unit cost of combined water and wastewater services ($0.01 per gallon), and then applied that cost to every geography in the country assuming that every community pays same unit cost and used12,000 gallons per month. 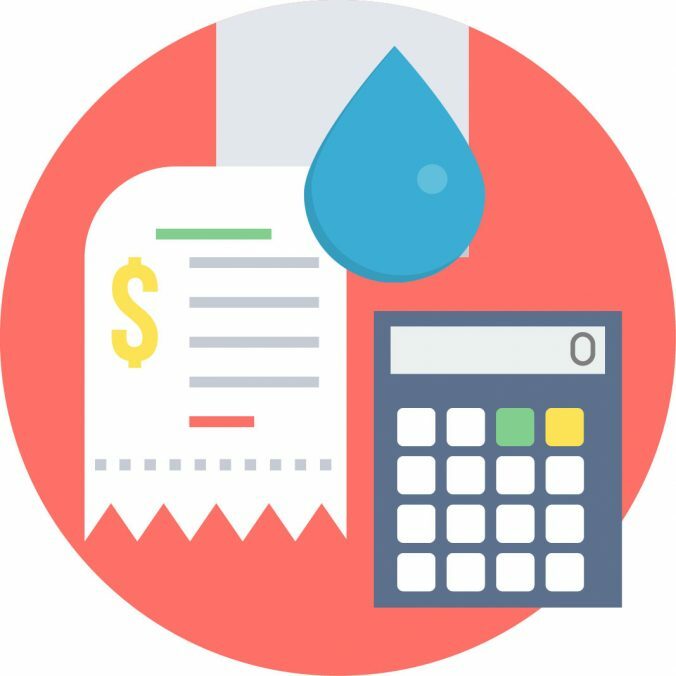 We know from our extensive research in the area that each utility prices water differently and that usage varies considerably across the country. Over the past 10 years, the EFC has built up a large database of water and wastewater rates, thanks to our state water and wastewater rates dashboards. As of June, 2017, we have benchmarking dashboards for thirteen states that include 4,493 communities across the country. Over the next several months we will use the data from these dashboards to look at the question of affordability at the community level from a number of different angles. Our databases include utilities that provide only water services, only wastewater services or combined services. While we don’t have data at this point from every state, we do have reliable community data for a significant number of communities that can shine light on affordability challenges— particularly in smaller communities which are often underrepresented in national rate surveys. In order to partially try to test some of the analyses and results from the MSU study, we carried out some basic analysis of the utilities in our database that provide both water and sewer. For the purposes of this analysis we limited the data to the eight states where our data is no older than three years old (2015 onwards) and where it is in a form that is conducive to comparative analysis across state lines: Alabama, Arizona, Connecticut, Georgia, Illinois, North Carolina, Texas, and Virginia. From these states we have rates data for more than 2,000 combined water and wastewater utilities. These utilities serve more than 45,000,000 people across the eight states. For most of these utilities we have demographic information for their communities, such as Median Household Income (MHI), average household size, and poverty rate. This allows us to plot water bills against a wide variety of demographics. 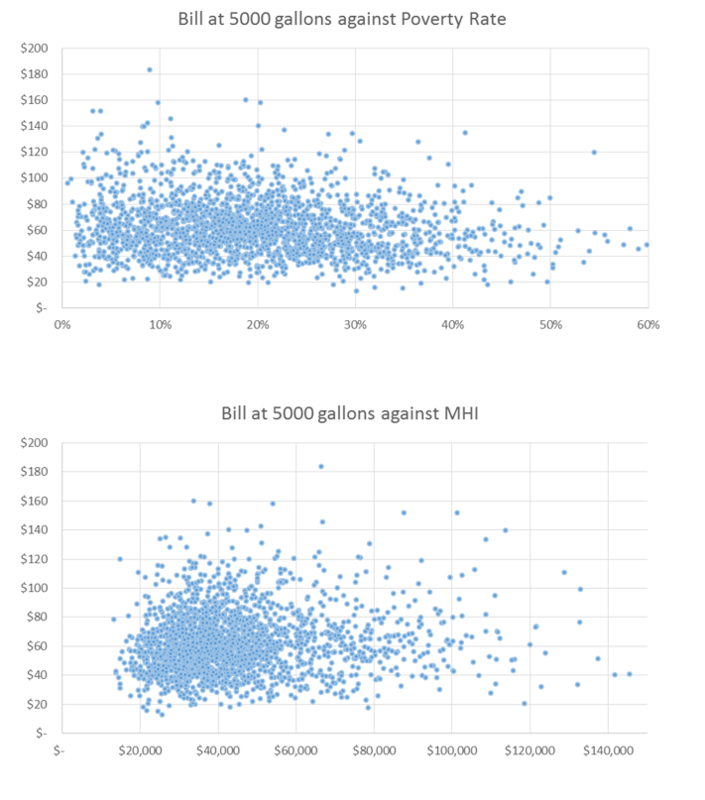 The two charts below show a basic example of potential bi-variate analysis including a utility’s combined bill at 5,000 gallons (the most common median water use we see in most of the states we study) against the poverty rate and median household income, respectively. From these two charts alone, the importance of utility level rates data can be seen. Two utilities might have the same poverty rate, or the same median household income, but have very different bills at 5,000 gallons. The affordability questions that face these two hypothetical communities will thus be quite different. In the coming weeks and months we plan on diving further into the data to identify specific affordability trends, challenges, and potential mitigation approaches. Let us know in the comments if there are any affordability related questions you would like to see answered! Daniel Irvin is the EFC’s Environmental Finance Community Advisor. Daniel graduated from UNC-Chapel Hill in May 2016. He majored in Public Policy and Philosophy, with a minor in Environmental Studies.